Questions? We get a lot of them and some of the most recent ones have revolved around life and work during the Civil War? So we decided to investigate a bit using New Haven as an example. A great primary resource for digging into a community’s everyday life is a city directory. The first listings of inhabitants in emerging American cities began as broadsides in the mid 1700s—and city directories soon followed, making their appearance right after the end of the Revolutionary War. These directories often provided an alphabetical list of citizens, including their street addresses and occupations, as well as a snapshot of the city’s government, public and private institutions, schools, societies, places of worship, and the businesses located in a single place during a specific period of time. Benham’s New Haven Directory and Annual Advertiser of 1863-4 provides just such a snapshot of New Haven. A directory can be a good starting point to answer questions such as: what types of occupations would women have held? What goods were being sold? And what types of services were available? New Haven was the largest city in Connecticut during the Civil War with a population of around 40,000. Benham’s New Haven Directory contains 10,965 of those names, most with their occupations listed including the regiments of those currently serving in the war. 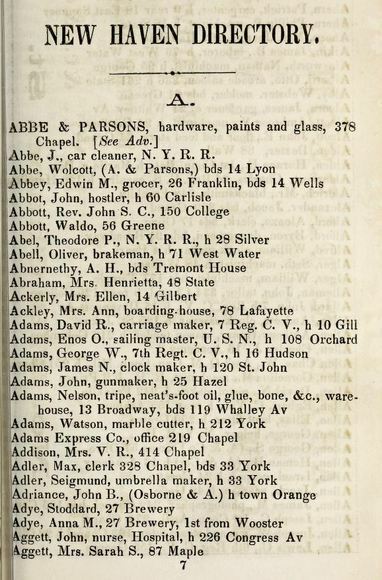 The first page of names in the A’s provides interesting examples of the types of work at which people were employed during the Civil War years with diverse occupations ranging from a nurse (John Aggett) to an umbrella maker (Seigmund Adler). While woman are not listed as often as men, we see that Mrs. Ann Ackley either ran or lived at a boarding house, and throughout the directory women are listed in various occupations including dressmakers, teachers, milliners, and laundresses. Often, even the ethnicity of the person was indicated with a notation; for example, “col’d” for a person of African descent. New Haven’s economy flourished during the Civil War era, as indicated by the number of businesses advertised in Benham’s and by the variety of goods and services on offer (click the blue pins on the map above to view an assortment of ads from the time period). 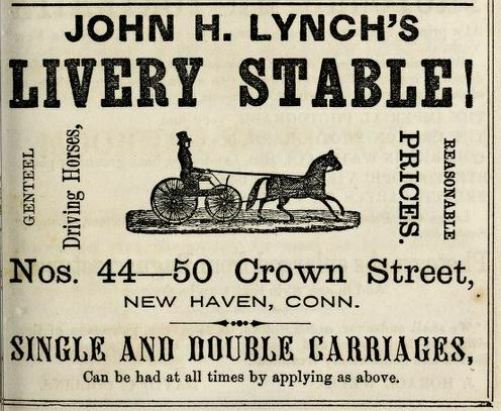 One of the largest manufacturers was the city’s carriage industry, but New Haven also produced rubber goods, pianos, and clocks as well as the patented camp chair. So, consider using a city directory to help answer your questions. It is a great place to start research, and you will be amazed by what you might find. “City Directories.” Connecticut State Library, 2017. Link. “Local History.” New Haven Free Public Library, 2016. Link. Benham’s New Haven City Directory and Annual Advertiser. Number Twenty-Four, 1863-4. 24. New Haven, CT: J.H. Benham, 1863. Link.